The Committee for the Washington Market Historic District was founded in 1984 to campaign for designation of a historic district in Tribeca. The Committee for the Washington Market Historic District was started with the purpose of protecting the integrity of the Tribeca neighborhood via the creation of an historic district. Formed in 1984, the Committee for the Washington Market Historic District immediately set to work toward the neighborhood's designation as a New York City historic district. Fueled by the changing character of the neighborhood, an impassioned group of residents began protesting inappropriate alterations to area buildings.3 Hal Bromm, the founder of the committee, stated that these alterations degraded the neighborhood.4 This notion drove the fight against new development on existing structures. Following the campaigns to protect individual buildings, the committee moved to better organize neighbors in the fight for the historic district. The committee enlisted the help of well known Tribeca residents Robert De Niro, Edward Albee, and Jim Rosenquist.5 Community members supported the cause by sending letters to Gene Norman, then Chairman of the New York City Landmarks Preservation Commission, and speaking at public hearings. ”A Chronology Narrating Historic District Designation in Tribeca,” The Historic Districts Council, January 2003. 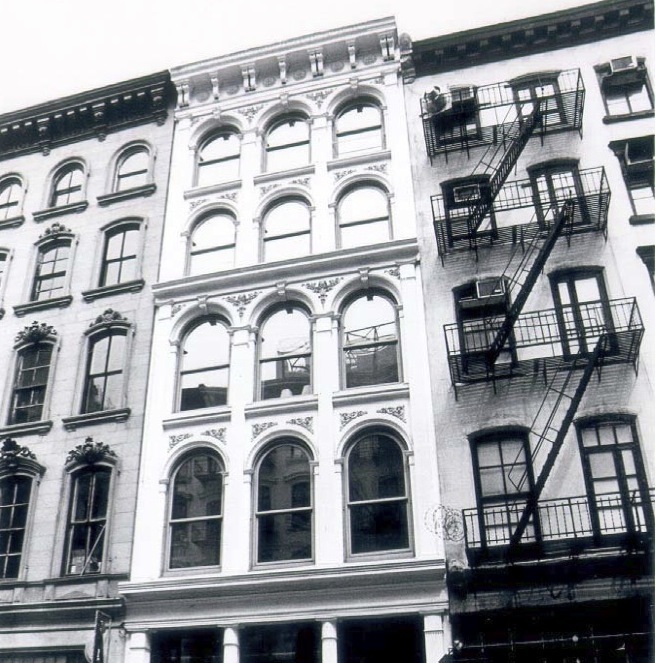 ”The Committee for the Washington Market Historic District: Questions and Answers,” A Chronology Narrating Historic District Designation in Tribeca, The Historic Districts Council, January 2003. ”Planned Tower Atop Old Building Upsets TriBeCa,” The New York Times, 21 August 1986. Meryl Branch-McTiernan, Interview with Hal Bromm. 18 October 2007, New York Preservation Archive Project Collection. ”Stop the Jackhammers; Send Cards and Letters,” Daily News, 4 April 1989. ”Progress for Tribeca,” Battery News, 8 May 1989. ”District in TriBeCa Wins Historic Designation and Elbow Room to Flaunt and Flex,” The New York Times, 12 May 1991. ”3 Historic Districts Are Created in TriBeCa,” The New York Times, 9 December 1992. ”POSTINGS: 28 Buildings Added to Historic District; City Extends TriBeCa Zone,” The New York Times, 24 November 2002.